In her book (TrineDay Publishing, 2010) Judyth Vary Baker tells a very detailed, fascinating account of her life story, including how she had used her widely-publicized reputation as a very gifted student-prodigy who managed to attract the attention of famed doctors and other luminaries, including Florida Senator George Smathers. It had started with news articles in the local Bradenton, Florida newspaper which were distributed through the Associated Press to numerous other states’ newspapers, (a number of which were pictured in her book). Her reputation for her interest in cancer research was soon known to Dr. Alton Oschner, the ex-president of the American Cancer Society and founder of the famed research hospital, the Oschner Clinic, in New Orleans. Dr. Oschner was not only the source of her quick rise in the medical field, but—eventually, when their basic moral values became irreconcilable—he became the cause of her downfall, resulting in the sudden need for her to become “invisible” after the assassination of JFK due to the risk of exposure of Oschner’s involvement with both Judyth and Lee Harvey Oswald. That led her to spend the next thirty-five years of her life in a state of absolute secrecy about the events she witnessed in New Orleans during the summer of 1963, afraid that any sign that she was behind their becoming public would cost her her life, just as it had to her mentors—Dr. Mary Sherman and David Ferrie—and her lover, Lee Harvey Oswald. In some cases—such as David Lifton’s rejection of her claims, based mostly upon her statement that she and Lee had planned to meet in Cancún when they finally freed themselves from their spouses—it was confusion based upon Lifton’s misperception that there was no such place in 1963. But according to Wikipedia, “Isla de Cancún” appeared on maps as early as the 18th century. Admittedly there wasn’t much of a population there until about 1970, but since neither of them had been there previously, it is reasonable to believe her claim that they merely saw the name of the island on a map showing the coast near their actual intended destination, which was the Mayan ruins some 125 miles inland, at Chichén Itzá and, beyond that, to Mérida, the capital of the Mexican state of Yucatán and the largest city on the peninsula. This story had much deeper roots, however, and Judyth has attempted to explain it all but that has not gotten much traction because of the tendency of her critics to close ranks quickly and suspend their intellectual curiosity as their “rush to judgement” becomes cast in concrete; we will reattempt to explain those roots again, in the next paragraphs. During the summer of 1963, Lee and Judyth had visited Tulane University’s Latin America Library and saw an exhibit there which presented the work of Tulane’s Dr. Edward Wyllys Andrews IV, a well-known archaeologist and anthropologist and author of several books on those subjects as well as zoology (with the publication of his “Notes on Snakes of the Yucatan”). And, as Oswald knew, Andrews also had connections to the CIA. It was the combination of Oswald’s knowledge of CIA’s presence in the Yucatan (and the existence of a CIA air strip on Isla Cancún)—as well as Judyth’s interest in anthropology (in which she would earn a bachelor’s degree two decades later)—that led them to plan to eventually marry in the city of Mérida. They had acquired their interest in that area as a result of seeing Dr. Andrew’s exhibit at Tulane—a major news item locally, and in the fields of archaeology/anthropology, in 1963—and in their hurried attempts to make fundamental life-changing decisions, they could only develop tentative plans about where they might later meet. There were never any reservations made, or travel agents engaged, or any other sort of specific “cast in stone” attempts to pursue this course; therefore, their knowledge of such things as the population density of Cancún or the best airport or seaport destinations which might be used to travel there was not pertinent to the issues now before us. What is unusual about these kinds of “misunderstandings” is the extent to which they have been blown out of proportion, as if her critics are in some sort of contest to find every single “error” or misstatement they can in order to finally prove that she is not who she says she is. How that pattern came about should be of concern to anyone whose primary interest is in finding real truths about the JFK assassination, and how others attempt to disrupt such inquiries. It should become obvious to all open-minded readers that there are other commonalities associated with many of the critic’s charges. The sampling below of additional critiques (it would take a book dedicated to the point to cover all of them) are representative of the general kinds of attacks—their viciousness, general speciousness and abstruse inanity—that she has been subjected to for nearly two decades, evidently the result of a well-coordinated attempt to make her revert to her previous silence. 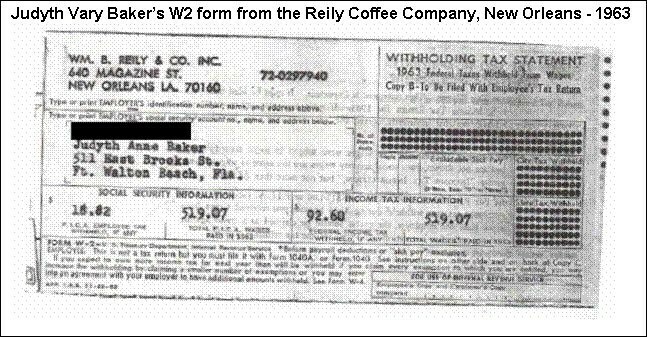 As we shall shortly see, Mr. Josephs admitted that he did not read her book, so he did not understand that she had supplied numerous old records, including a copy of a bank statement (p. 317) dated June 5, 1963 addressed to her at 1032 Marengo Street, near the Magazine Street bus line. 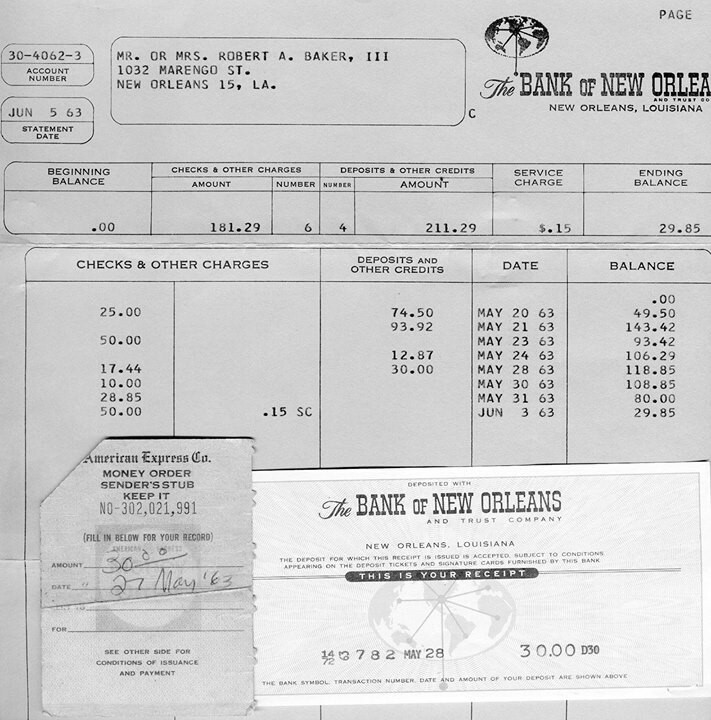 That bank statement includes a reference to a $30.00 deposit on May 28th, which was a repayment of a two-day cash loan she had given to Oswald on May 26th to rent a small office space (in the same building as Guy Banister’s office, and done at his urging) for Lee to establish himself as a serious candidate for being recognized as the head of a local office of the Fair Play or Cuba Committee (FPCC). 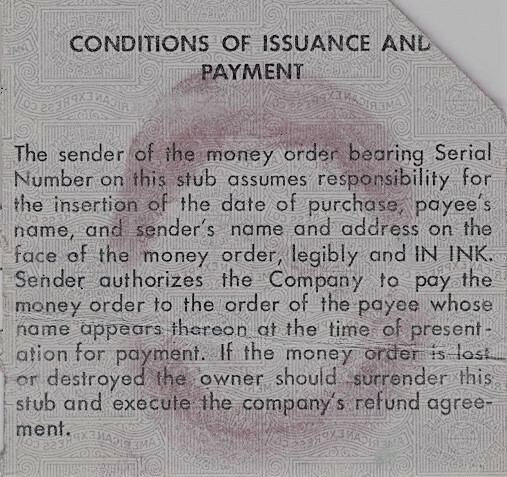 He wanted to have the stub of an American Express money order for $30 as proof of the payment of a month’s rent, and noted that point in the letter he wrote on May 27th to V. T. Lee, the “national” head of that organization in New York. On the reverse side of the stub where the “legalese” was printed, Judyth left Lee a little “souvenir” to remember her by. The lipstick undoubtedly contains her DNA which she may someday have tested if anyone is willing to assist her with the cost of doing so. When Judyth questioned Lee about why he wanted to set up a New Orleans office of the FPCC, he explained to her that it was a “ploy” to help Banister and the HUAC (House Un-American Activities Committee) ban the organization by having it listed as a subversive organization (all of this is explained in detail in her book, pp. 315-318). Of course, it was really about Banister and his superiors wanting to establish “communist credentials” for Oswald. It must not have occurred to Mr. Josephs that the shortened life-span of Mr. Oswald might have precluded his having an appropriate opportunity to address this point. “But here is the clincher. [She had to have a] . . . reason for Oswald to be in line for the CORE rally. And since Garrison’s outline leaves them out in the cold in all respects, they had to come up with something, anything. According to them Oswald got in line because he made a bet with Shaw that he could register to vote, even though he was Caucasian. [Had he read the book, he would have known that it was to prove that they would register him because he was Caucasian, even though he did not live in the area, which ultimately caused his attempt to fail]. They lead this off by saying that the prisoner delay is the excuse for the long stop in Clinton. The problem with this is that 1.) The hospital is in Jackson, and 2.) The voter rally was in Clinton. In their scenario, there really is no reason for Shaw, Ferrie and Oswald to be in Clinton at all. [There was a much better reason, one that was fully explained, but one must read her book for that]. It should become clear to most readers by now that, while there are a number of highly credible writers at that website, they serve mainly as window dressing, behind which another set of writers exist in the background, ready to pounce on any book that strays outside their carefully-crafted boundaries. They include Mr. Josephs, Joseph Green – who wrote a comparably disjointed review of my first book – Martin Hay (whose review of Dr. William Pepper’s latest book is filled with similarly unsupported points and false assertions, as I explain in Appendix A of my latest book, ) and Seamus Coogan, their pit-bull attack guard who performs equivalent chores. This phenomenon has been practiced over and again, not just in my own and Dr. Pepper’s and Judyth V. Baker’s cases, but on books by such other acclaimed authors as Doug Horne and Peter Janney. The CIA hiring a girl right out of high school to be a cancer researcher. David Ferrie as a cancer researcher. The best that can be said about this attempt to discredit her is that it is a deliberately misleading, rather superficial effort, given the lack of pertinent evidence or any offer of a rationale which might justify such cryptic treatment. First, it wasn’t the “CIA” per se which made that hiring decision. It was done under the authority of Dr. Alton Ochsner Sr., the head of the Ochsner Clinic in New Orleans, who was interested in recruiting competent individuals to perform very important, but often-mundane, tedious and routine tasks to assist in their mission to create a reliable cancer-inducing vaccine for the CIA’s then-current high-priority effort to kill Fidel Castro. As previously explained, many nation-wide newspaper articles had appeared regarding her independent research as a student, which apparently caught Ochsner’s attention. Her book, “,” devoted six chapters—well over 100 pages—to documenting her extensive background and skills in precisely what Ochsner would have been looking for in filling that entry-level position. Ochsner’s intent was to find a competent and reliable laboratory technician to handle the cancer-inducing viruses, a skill which he had personally arranged for by training this aspiring student-scientist before bringing her into the program, when he got her an invitation to go to a fast-track training course at the Roswell Park Memorial Institute in Buffalo, New York. Over a year later, after more training at the University of Florida, he brought her to New Orleans, where she was placed under the direct supervision of Dr. Mary Sherman, working alongside David Ferrie and Lee Harvey Oswald. Judyth explained that others were also involved in different parts of the project. Questioning David Ferrie’s likelihood of being involved in cancer research—without explaining why—is yet another attempt at misdirection, through a rhetorical non-sequitur, a practice one would not expect from a college professor, ill-befitting anyone having a modicum of concern for his reputation. It is sufficient to note that Ferrie was a highly intelligent man of many varied interests including his right-wing political views, well known to many in that locale, thus apparently considered by Ochsner to be the perfect candidate for such a position. Finally, to assert that Dr. Mary Sherman, a very accomplished doctor of orthopedics, would certainly not be interested in cancer research is the epitome of absurdity. He should have consulted the front page of the New Orleans States Item that reported her death on July 21, 1964 in a headline that stated: “Cancer Work [was] Slain Doctor’s Main Interest.” The newspaper further described her as an “internationally known bone specialist” whose main area of interest was “bone cancer treatment and research.” That McAdams had clearly not so much as read anything about her before making such a preposterous statement “speaks volumes” about everything else about such a naïve and vacuous assertion. For those who continue to question her legitimacy, one can only ask: who was the Judyth Vary Baker claiming knowledge of Oswald who met author Ed Haslam in 1972 in New Orleans? (See for details). It was clearly not the same Judyth Baker of today. Someone was impersonating Judyth, who had left New Orleans nine years previously, which lends great support to the idea that a very dangerous secret was being preserved through cover-up and misdirection at a high level . . . And it reached all the way to the top of the American power structure. (p. 568 of Me and Lee). That kind of support from highly accomplished researchers and authors far offsets—and renders trivial—the impertinence that seems to infect all of the caustic “bottom of the barrel” invective to be found in the various critiques that have been written about her in many venues, one of which filled 200 webpages on the Education Forum in just a few weeks in 2010. Most of the critics are merely armchair pundits who have never done intensive research and/or published their own books, a vetting process that might have added value to the body of work regarding the supposed common goal of solving the historic mysteries related to the JFK assassination (It’s much easier to take pot-shots if you have no reputation to think about). And most of those posts involved variations of the same impertinent points noted above. Together, they amount to: “Much ado about nothing, yet told with sound and fury but ultimately signifying nothing” (with apologies to the “Bard” for conflating his phraseology). Finally, let me share an epiphany that just came to my attention upon re-viewing the video series “The Men Who Killed Kennedy,” Part 8 “The Love Affair” (2003 – now freely available on YouTube) about what Judyth said at the 37-minute mark. It should remove any doubt about her veracity for anyone who still doubts her story. The core maxim that applies in such situations as this is, “If you have not been attacked, then you are probably not over the target.” Judyth Vary Baker has been systematically attacked for nearly two decades by those who would prefer that she desist from her efforts to prove Lee Harvey Oswald’s innocence. That suggests that she has been right over the “target,” and that she is too close to exposing the darkest truths. There is little doubt that much of the hullabaloo in this case is the result of the dark forces still at work as they employ every resource available to protect the myths at all costs; the “overkill” response merely summarized here was created and distributed by the servile minions who are evidently being well paid for their services. The bottom line is that Judyth Vary Baker has very impressive credentials and is backed by some of the most accomplished researchers in the field. Neither of those distinctions apply to the majority of her critics. Phillip F, Nelson [send him mail] is the author of . His previous books include , , and Remember the Liberty.